Sunday afternoon saw a return to the Apollo Theatre, for the members of Newport Jazz Club, for the Dennis Rollins Velocity Trio. 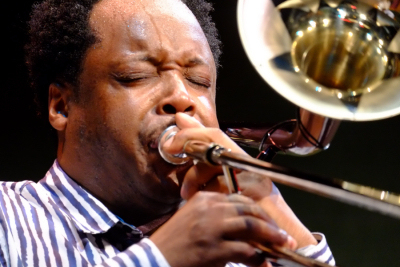 In a radical departure from most conventional jazz outfits the superlative Dennis Rollins takes the trombone, an instrument more associated with trad jazz bands, and turns it into a tour de force front line instrument in it's own right. Opening the set with "Utopia" from his latest cd Dennis took the audience through a musical journey that not only showcased some of his influences including his interpretation of Pink Floyd's "Money" and "Ujammer" inspired by Bob Marley but also explored themes such as the need of people to depend on each other as demonstrated in "Symbiosis" which is the title track from his latest cd. With strong support from Ross Stanley on Hammond organ and Tim Carter on drums the trio ended the afternoon with a well-deserved standing ovation.